Jawaharlal Nehru Govt. 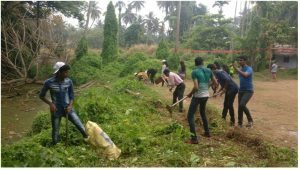 Higher Secondary School, Mahe, is one of the leading and most sought after Higher Secondary Schools in Mahe region imparting quality education. This institution has been nurturing the young minds of Mahe for the past hundred years with the belief that “The heart of education is the education of the heart”. The history of Jawaharlal Nehru Govt. Higher Secondary School Mahe is very much associated with the history of Mahe. Mr.Voltaire Simon, a Missionary of German Basel Mission had been running an English school near Mahe in Pathira Kunnu at Chombala. 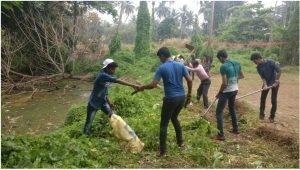 In 1881, the Mission, with the permission of French Government, started a branch of it in Mahe by adopting a traditional school (Kudi Pallikudam ) run by Puthalath Kunnumpurath Perachan Vydiar. Perachan Vydiar had worked as a teacher in this school for years. 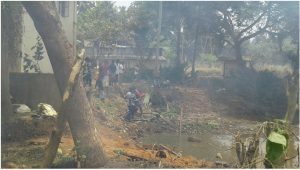 In 1914, when the First World War broke out, its waves resounded in the social atmosphere of French Mahe also. The French who had to bear the brunt of the German attack in the war withdrew the permission granted to function the one and only English Medium School run by the German Basel Mission in Mahe. Subsequently on 21st January 1916, Ecole Angalise came into being with seven classes and 281 students on the rolls. The then prison house (the place where GLPS Mahe situates now) had been converted into a fairly convenient building to house the new school. The school fees ranged one Anna per month in the I standard to Rs.2/- in the III form (VII Std). Sri. Cacatte Anandan was ‘Le Directeur’ (the first Head of School).The school was then brought under the control of the College Calve in Pondicherry and named as Calve Branch School. The school was a Middle school having classes up to III form. After passing the III form, students had to go to Tellicherry for their high school studies by trains. Hence the demand of parents for beginning a High school became lively in Mahe. In the mean time, the school was shifted to a structure located on the charming site of the present school. The building was only a part of a godown used for storing coal to be supplied to the French ships which cast anchor out at sea off the shores of Mahe during their voyage .In 1929, the Government raised the school into a High School and renamed it as Calve Branch High School. It was then recognised by the University of Madras. The first batch of students appeared for the Matriculation Examination in 1932.Out of a strength of 22, 11 students were sent up for the Public examination after a very strict selection. In 1934, Sri Palery Canary became the Headmaster of the school. One important landmark of the institution occurred during the regime of Palery Canary -The school became an autonomous unit under a new name ‘College Mahe’ de La Bourdonnias in memory of Mahe de La Bourdonnais, the captain of a ship who conquered Mahe in 18th century. Till 1935, the school was boys’ school. In 1935 Government permitted girls to the school and co-education was implemented. At first, permission was granted to admit not more than 50 girls. Later this restriction was withdrawn. When Mr.Palery Canary passed away in 1941, Sri. A.C.Krishnan was in charge of the school for a couple of months. Then Sri.K.G. Parameswarier was appointed the Headmaster. During this period, the school got cent per cent result in the Matriculation examination of the Madras University for three years (1943, 1945 & 1947).The School bagged first rank in the Madras Presidency twice. For the meritorious service in the cause of education, he was awarded the honour of ‘ Officer d’ Academie’ by the President of the French Republic. In 1952, when Parameswarier died, Sri.Paleri Damodaran became the headmaster of the school. His efficiency, vision and integrity brought a good name to the school. Since the strength of the school increased beyond expectations, in 1953 the annexe building with an accommodation for seventeen classes, was hired and classes from I to V standard were shifted. After the liberation of Mahe in 1954, the school had an all-round progress. In 1960, a school building was constructed near Moopante Kotta to house girls section. The girls from V to VI form moved to the new school in 1961.At the same time, plan for constructing a spacious building for La Bourdonnais was going ahead. In 1962, Sri. C. E.Bharathan, the then Councillor for Education, Pondicherry and an old student of the school laid the foundation stone for the building. The old building was demolished and the school had to work on shift in the annexe building for a few years. In 1966, the new building was inaugurated by Sri. S.L, Silam, the then Lt. Governor of Puducherry. Just before inauguration of the school, it was renamed as Jawaharlal Nehru High school. 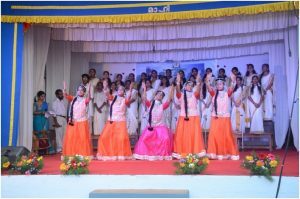 Classes from I std to VIII Std switched over to the Kerala S.S.L.C. Then it was christened Jawaharlal Nehru Govt High School. The Boys from I to IV standard were housed in the annexe building and the girls from I to IV standard went to Ecole de Filles. The last batch of Matriculation Examination appeared in 1968. The Golden Jubilee of the school was celebrated in the year 1968. In his speech delivered in the valedictory function of the golden Jubilee celebration, Sri. J.A. Ryan, Director of Public Instruction, Pondicherry said, “La Bourdonnais College is not only the oldest schools of Pondicherry State; it has also to its credit a long list of eminent men who are noted for their character.” Sri. 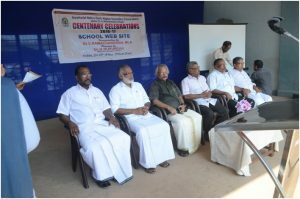 T.Krishnan Gurukkal, old teacher of this school was honoured in the function by Sri. J.A.Ryan, Director of Public instruction. Mr. Palery Damodaran had to stand down for a few years to his senior Sri.Ch. Narayanan, Sri. N. Sivaprakasham and Sri. Periathambi. 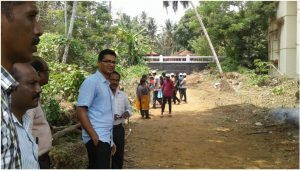 When Periathambi left Mahe, Mr. Paleri Damodaran again became the Head master. He was the Head of the school for nearly fifteen years. In July 1968, he gave charge to Sri. C.P. Prabhakaran to take up his new post as Assistant Professor of English at Tagore Arts College, Pondicherry. Then M/s. P.V.Balakrishnan, K.P.Mukundan & P.V. Goplan were in charge of the school. 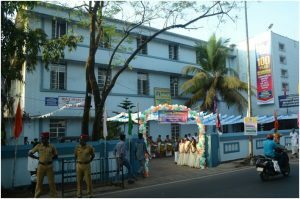 Consequent on the decision of Government of Puducherry to start a Junior college in Mahe, in 1970, the new building of High school was placed at the disposal of Mahatma Gandhi Government Arts College Mahe. In 1978, the Diamond Jubilee was celebrated. The jubilee was inaugurated by Sri. V.N. 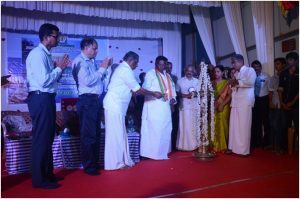 Purushothaman, Chairman, Municipal Council, Mahe. 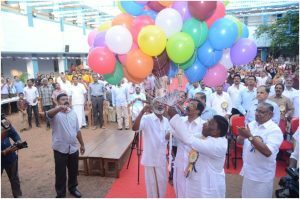 Hon: Chief Minister of Pondicherry, Thiru, D. Ramacandran and Hon: Pro-Vice chancellor of the University of Calicut participated in the Valedictory Function of the Jubilee. 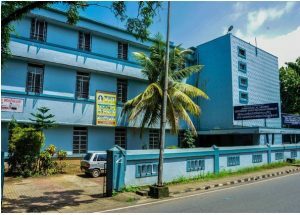 In 1985, the school re-occupied its own building when MGGA College was shifted to Mount vera, Chalakkara. In 1991, consequent to the de-linking of Pre-degree from the college, the school was upgraded into a Higher Secondary School with Science, Commerce and Humanities streams and came to be known as Jawaharlal Nehru Govt Higher Secondary School, Mahe. The galaxy of Headmasters during the first 50 years were Messers, C.C.Anandan, Appoli Ner Lopoes, Michilotte Kumaran, Palery Canary, K.G. Parameswariar, Palery Damodaran, Ch. Narayanan, N. Sivapraksam and N. Periatambi. Now, Jawaharlal Nehru Government Higher Secondary School has completed 100 years of its glorious existence. This institution has produced a large number of distinguished alumni who have made their mark in various walks of life. Prominent among them are K.V. Padmanabhan, the former Ambassador to Iran, K.G. Subramannian, the world famous Artist, M.P. Bhaskaran, an internationally known expert in English, I.K. Kumaran, veteran Freedom fighter and the first Administrator of Mahe, well known writer M.Mukundan, C.E. Bharathan, former Councilleor of Education, Puduchery and E. Valsaraj, former Home Minister, Puducherry. The great martyr to the liberation movement of Mahe, Sri Usman master was the Hindi teacher of this institution.